How Much Should You Expect to Pay for a Pancake Maker? Which is the Best Pancake Maker for You? With an electric pancake maker, you need an electrical outlet to make it work. 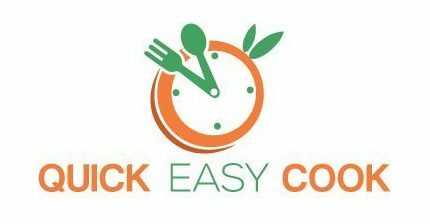 Aside from that, the whole process of cooking pancakes is made easier as the cooking device has its own temperature control and timer settings. If you’ve seen an electric waffle maker before, know that an electric pancake maker works in the same way. Stovetop pancake makers work like regular skillets and frying pans. However, since they’re specially made for cooking pancakes, they are designed to produce perfectly round results. Since pancakes are often made in batches, stovetop models can also come with several pancake molds in one hot plate. Multi-purpose – Most pancake makers can also be used to cook other types of food like crepe, tortilla, and eggs. Cooking surface – Usually made with nonstick surfaces, pancake makers make it easy to flip pancakes and achieve clean results. 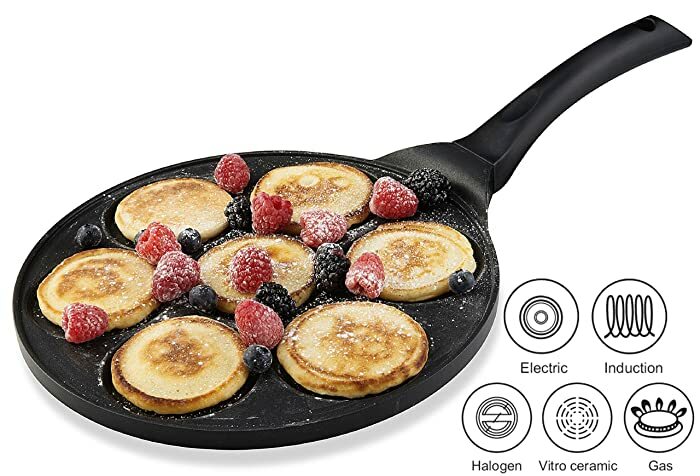 Electric pancake makers – Equipped with temperature and timer controls, electric models are built to make pancakes with fewer efforts (than using a regular stovetop model). When buying a pancake maker, check on the accessories included in the package. As bonus, these things are sometimes included in a pancake maker package. Use a silicone spatula when flipping the pancake. Needless to say, stovetop pancake makers are cheaper than electric models. Should you decide to go for stovetop models, expect to pay around $20 for a good quality item. And for an electrical model, your budget should be around $50 (more or less). When choosing the Nordic Ware pancake maker, you have the option of either getting the 4-piece or 7-piece design. If you want to make more pancakes in one go, then choose the model with 7-pancake capacity. Autumn leaves – with designs of leaves, apples, nature, etc. Holiday – with designs of star, snowflake, snowman, etc. Monsters – with designs of cute monsters. Smiley – with designs of faces that are smiling, winking, sticking the tongue out, etc. Snowflakes – with designs of different styles of snowflakes. Zoo friends – with designs of monkey, elephant, giraffe, etc. Made of cast aluminum materials, this model of stovetop pancake pan is warp-resistant. It also comes with the nonstick coating that’s PFOA-free. You can cook any pancake recipe with this cookware – whether you make your own pancake batter or buy a ready-mix package in a box. Recipes are also included to inspire you to make your own pancake mix. Note that this particular model of pancake maker is made in the USA. It also comes with a 10-year warranty. Perfect shape – You’ll get perfectly round pancakes as there are molding patterns built into the pan. Not messy – Each mold is nonstick. Affordable – It comes at a very reasonable price. Lightweight – It’s easy to use and manage. Easy to clean – You just need to hand wash it using mild soap and water. Not induction-friendly – Aluminum cookware (such as this model) does not work with induction cooktops. Hard to flip – Pancakes can be a bit tricky to flip. Use a silicon spatula and start along the sides of the pancake to flip it. 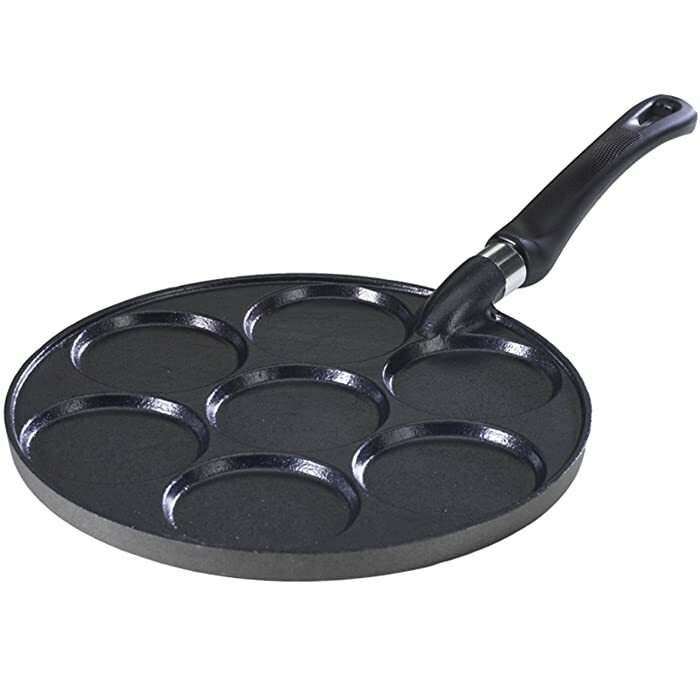 If you’re used to cooking pancakes in a frying pan, you might find it a bit difficult (at first) to use this pancake maker pan. However, when you get used to it, you will find that you can create more perfect pancakes easily. This stovetop pancake maker is designed with 7 cute emoji molds – so, you’ll get smiley, goofy, and winking emojis in your pancakes. Each pancake measures 3 inches in diameter and about ¼ inch thick. And since the cooking plates are nonstick, they’re very easy to flip. 7 at a time – You can make 7 emoji pancakes in one setting. Fun to make – These pancakes will make anyone’s day brighter. Clear faces – The designs are clear and precise. Easy to flip – It comes with nonstick surfaces. Easy to clean – pancake batter will not stick to the pan. 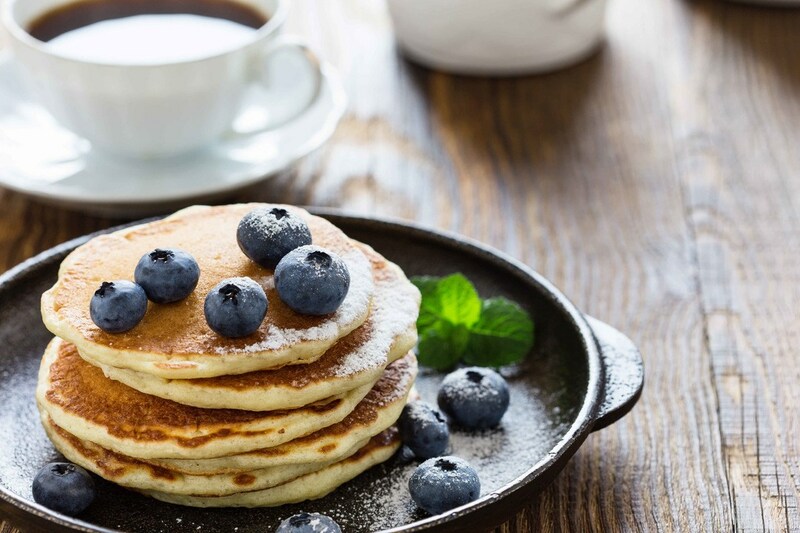 Thin pancakes – The mold is only ¼ inch deep – so, you can’t really make pancakes that are thicker than that. Not that easy to flip without the right tool – Use a silicon spatula to effectively (and easily) flip the pancakes. This model of pancake maker can make pancakes that are appealing to both kids and adults alike. This is probably the most modern and up-to-date pancake maker of our time (everybody knows about emojis, and everybody loves them). So, if you want to add some fun into your pancakes, consider this model. Here’s another stovetop model of pancake maker – it’s a skillet with 7 molding designs (4 molds design is also available). Made of die cast aluminum and induction-friendly bottom, you can use this pan on all types of stove. The surface of the pan is nonstick and made of Pfluon (double layer) materials. To take care of its nonstick feature, it’s recommended that you only hand wash this pancake maker pan. Perfectly round pancakes – The skillet comes with molding sections to guarantee perfectly shaped pancakes all the time. Serving size – It makes small pancakes – good for 1 serving of pancake for a child. Fast – You can make several pieces of pancakes in 1 setting. Nonstick – The pancakes are easy to flip and remove from the pan when done. Easy to use – You can quickly make pancakes with this cooking device. Small pancakes – This model of pancake maker can only make small-sized pancakes. Thin pancakes – The molds are quite shallow that you can only make thin pancakes. This pancake maker is easy to use and can quickly prepare several pieces of pancakes in one go. It’s definitely a time saver – especially if you pick the model that has 7 molds. Because of its design, you can also cook crepes and eggs in this pancake maker. This is an electric pancake maker with a flip over hinge design. Because of its enclosed design, you won’t need to flip over your pancakes as both sides get cooked at the same time. This model is designed to cook 2 pancakes at once (as there are 2 available molds). In minutes, you will have 2-regular sized pancakes to eat. Included in the package is a recipe book for making pancakes and other types of food. You see, you can also cook egg recipes with this pancake maker. Even cooking – Both pancakes are cooked at the same time. Fast – Just pour the batter into the mold and your 2 pancakes will be ready in a couple of minutes. Good for 2 people – It makes regular sized pancakes and it’s easy to make several batches. Fast – Cooking pancakes is not time consuming when you’re using an electric model. 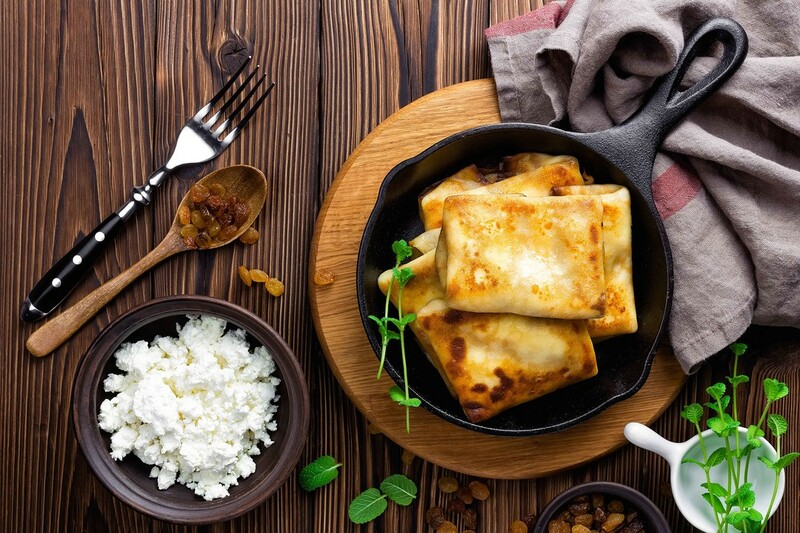 Cooking plates not nonstick – Use cooking spray before pouring out the batter into the molds. Hot plates not removable – You can’t remove the plates to wash them – however, you can wipe them clean. If you want to make 2 adult sized pancakes in a few minutes, this model can be a good option for you. However, since pancakes can stick onto the pan, make it a point to apply cooking spray before cooking your pancakes. Made with stainless steel construction, this model of pancake maker is attractive and durable as well. This is an electric model, so you just need to plug it into an electrical source to work. This particular unit works like a waffle maker as it has a closed design. However, you can open it wide if you want to double your cooking space. Operating this pancake maker is easy as there are 2 knobs for the temperature and timer settings. It also comes with removable and reversible pancake plates (nonstick). These plates are dishwasher safe, by the way. Designed with a locking lid, you also have the option of storing it in the upright position. Removable plates – Having removable plates make them easier to clean. Simple to use – Just plug it in, pour the pancake batter, and wait for the pancakes to be cooked. Nonstick plates – Removing pancakes from the cooking plate is very easy. Detailed design – You will see the markings on the hot plates reflected on the cooked pancakes. Thin pancakes – The pancake plates are shallow and will only make thin pancakes. Uneven heating – All the pancakes will not necessarily cook at the same time. You can choose from any of the pancake makers in the Top 5 list and still come out a winner as they are all very good products. Yes, they’re actually the best of the best – so, there’s no need for you to look elsewhere for this type of product. If you ask me, I highly recommend the Nordic Ware Scandinavian Silver Dollar Pancake Pan. With this model, you can choose from many different designs. You can go for plain, smiley, nature, cartoons, and more. You also have the option of choosing the model with 7 or 4 pancake molds. 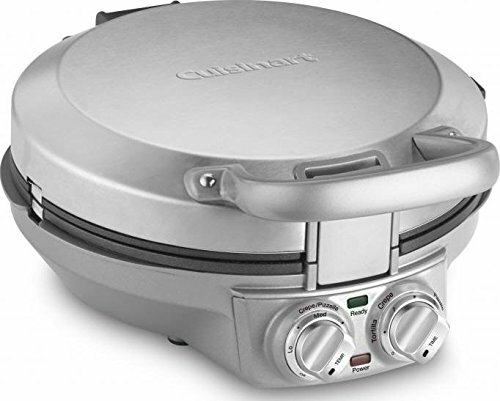 If you want to go for an electric model of pancake maker, there are also some good options included in the Top 5 list – particularly the Cuisinart CPP-200 model. For me, it’s the best electric pancake maker today.It really is beneficial to make your own homemade pancakes. Aside from saving on money, you can also create healthier pancake recipes when you are in control of the ingredients, right? 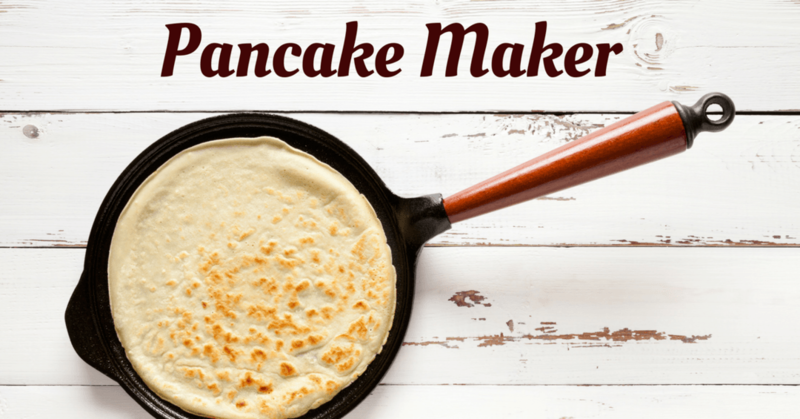 With your very own pancake maker at home, you can easily make this food at any time of the day. I would also suggest experimenting on the toppings to add variety to this simple dish. Remember, pancakes are always complemented by sweet toppings (ice cream, syrup, etc.) – but you can also use sweet types of fruits (strawberries, blueberries, bananas) to make this dish healthier. Do share this post with other pancake lovers, ok? And I always look forward to your comments – so, leave me a message below.